Cozy chalet, ideal for a ski weekend getaway! 1 mile to Stratton Access Road. 15 minutes to Bromley. 20 minutes to downtown Manchester. Close to Vermont country shopping in Grafton, Jamaica and Londonderry. Take advantage of all 4 seasons with hiking trails and rivers accessible nearby. There is pool right next to the house in the summer months and a new open green space. It is an upside down style house with 3 Bedrooms and 2 full bathrooms on the main floor. The 'master' is a queen bed and has a TV. The 2nd bedroom is two twins (or an easy queen pushed together. The third room has a bunk bed. Each room has it's own closet, dresser and heat control. There's also a ski gear room with full washer and dryer. Each bathroom has a shower, one with a tub. All linens provided. Up the stairs is an open living space with a large living room in front of the wood burning stove and flat screen TV. Perfect for football games, hockey games or movies after a day on the slopes. DVD player. Full kitchen and pantry with fridge, stove, dishwasher, microwave, toaster, coffee maker, all pots, pans, dishes, etc. Dining table and breakfast bar. Upstairs is a loft with a pull out couch for two. You could fit more in sleeping bags if need be. Basic Cable, DVD player, puzzles, games and books to enjoy. Cute comfy space! Was great for 5 people we had. Having two bathrooms was perfect. Owners were responsive about any questions right away! Very grateful for the cozy space. 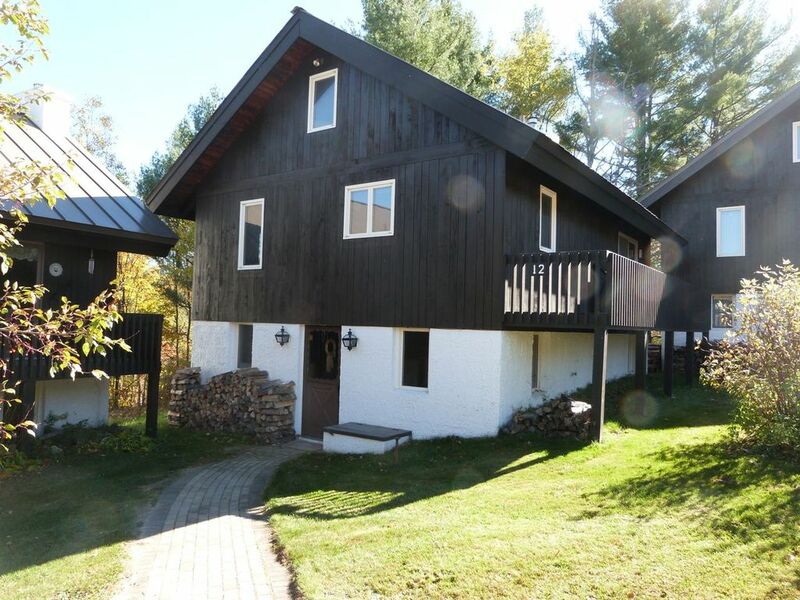 We rented the 3-Bedroom and loft house for two consecutive weekends for March skiing at Stratton. The house was perfect for kicking back after an energetic day on the mountain. Overall unit conditions were clean with a nice open family centric main level. The kitchen is well-equipped and having a dryer in the unit was key with ever-changeable spring skiing conditions. Also very convenient to the general store, 7-11, pizza, and Norse House ski shop. Good value. We would stay again. We had such a great stay at Spencer's home. The entire house was stocked with useful things including spices, games, cleaning supplies, blankets, etc, and all sheets and linens were clean. The house is about 5 minutes from Stratton which made our trip very convenient. Spencer was extremely helpful and nice. He was easy to contact and responded very promptly to my ton of questions. We want to stay again next winter! What a great place to stay while skiing Stratton! The house was clean and comfortable. The bedrooms and bathrooms were good size .The layout is perfect with the great room upstairs . Whether you are in the kitchen, sitting at the dining table or relaxing on the big comfortable couch by the warm wood burning stove the whole family is together in the same area. There is plenty of room for a big group. The loft is a perfect retreat for kids. We loved the house, the Winhall community and the owners were very easy to deal with. Definitely coming back! Great house with lots of room, clean and open layout - perfect for a few friends getting together for a ski weekend at Stratton. Very convenient, nice owner and overall an enjoyable time. Hope to rent again this season! We had a great stay at this home. The house was minutes to the mountain. Very comfortable for a family of 5 (although could sleep more). We loved the open design between the kitchen and great room so we all could be together. It is definitely an older property, but very clean and has everything you could possibly need or want for the weekend in the kitchen, and comfortable furniture. Owner was very responsive before and during stay if needed. House was clean, and warm considering it was a very cold weekend. Hope to rent again sometime.